The East India Classic: Havana Blend has been perfected using a proprietary binder and filler with twenty different tweakings of the blend to get it just right. With a San Andres Wrapper, this stick from Gurkha is a box-pressed, full flavor cigar including earthy, nutty undertones made in Nicaragua. When nothing less but the best will do, cigar aficionados head towards Gurkha ultra-premium cigars. For years Gurkha has been the choice cigar among the most prestigious, from corporate executives to royalty. East India Classic: Havana Blend is a box pressed blend of proprietary binder and filler and a dark brown Mexican San Andreas wrapper. The medium bodied, full flavored Classic Havana was created by Juan Lopez, a masterful perfectionist, who made over twenty tweaks to the blend to get the precise flavors just right. 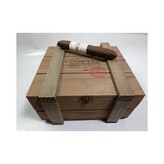 The result is a true classic for the cigar world to enjoy for years and years. East India Classic: Havana Blend has at its forefront notes of pepper and cocoa with, nutty undertones and a sweet cinnamon spice. Perhaps, this is not a coincidence, that in 1767 East India Trading Company established the largest cinnamon estate in Asia. Kaizad Hansotia, CEO and founder of Gurkha Cigar Group, continues to raise the bar among the luxury and premium cigar industry. In 2016, Gurkha Cigar Group opened its first exclusive bar and smoking lounge: The Cigar Lounge at Artisan inside the Hotel Sofitel in Mumbai, India. More than 300 guests attended the opening that featured some of Gurkha’s best cigars, including a display of Gurkha’s His Majesty’s Reserve cigars, the world’s most expensive cigars. The demand for Gurkha’s super-premium cigars has continued to rise steadily in the Asian and Indian markets over the past few years. The Cigar Lounge at Artisan is a place where cigar enthusiasts can enjoy an all- inclusive, unique cigar smoking experience in a luxurious environment. The Cigar Lounge has a handsome interior featuring a lush garden. In addition to the new Gurkha cigar lounge, Hotel Sofitel has launched a private members-only club for cigar aficionados with lockers available allowing you to store your own bottle of Single Malt Scotch in the cigar lounge. A perfect accompaniment to an East India Classic: Havana Blend!